While much public attention focuses on political corruption, Hiddush's focus is on the challenges of religion and state in Israel. Human nature is susceptible to deviation from the righteous path, as was recognized in the Bible: 'the imagination of man's heart is evil from his youth' (Gen. 8:21). However, evil behavior is more reprehensible when carried out by religious leaders, particularly when done abusing their authority. It is too common for these religious functionaries to to aggrandize the moral essence of their religious teachings and their superiority over secular (let alone religious non-Orthodox) conventions and practices. Apparently, they (so they say) operate as agents of the divine, which stands above all other human values. The Sages of the Talmud understood the seriousness of the potential impact of deviating rabbinic figures: 'Any Talmid Chacham (Torah scholar) upon whose garment a stain is found is worthy of death' (Babylonian Talmud, Tractate Shabbat 114A). In the last couple days, a new chapter was added to the never ending saga of Israeli religious officials who view the law as merely a suggestion. Whether for personal benefit or political opportunism, they do not hesitate to deviate from the law. For example, in May 2017, former Chief Rabbi Bakshi-Doron was convicted of fraud [link] for a bonus-scam that swindled hundreds of millions of shekels from the government in civil servants’ wages. He was actually the second(!) former Chief Rabbi convicted of fraud this year: former Chief Rabbi Yona Metzger pleaded guilty to fraud, theft, conspiracy, breach of trust, money laundering, tax offenses and accepting bribes involving 10 million NIS under a plea bargain. Yosef, the son of former Sephardic Chief Rabbi Ovadia Yosef, was convicted of two breach of trust offenses. Just this week, Rabbi Avraham Yosef (the former Chief Rabbi of Holon) was sentenced to a five-month suspended sentence and to pay NIS 75,000 in restitution for obligating business owners interested in acquiring a kashrut certificate to only work with certain kashrut inspectors. 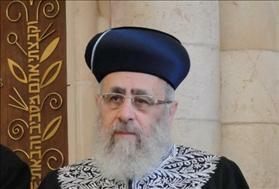 Yosef, the son of former Sephardic Chief Rabbi Ovadia Yosef, was convicted of two breach of trust offenses. Not to be left out, Chief Rabbi Yitzchak Yosef (another of Rabbi Ovadia Yosef's sons) was secretly recorded illegally manipulating the process of selecting city Chief Rabbis to favor the interests of the Shas party, under coercion from Minister Rabbi Aryeh Deri (Chairman of the Shas party). This recording was made public on Israeli radio yesterday. These and many other examples provide indisputable evidence: Israel’s Chief Rabbinate is a rotten vessel that corrodes its contents. When political power meets religious authority, at a nexus involving a great deal of money, the State, the People and their heritage are the losers. Those who love and support Israel as a Jewish and democratic state must act to restore the honor and integrity tarnished by the Chief Rabbinate and its political supporters. We must demand radical change in the religion-state relationship, beginning the dissolution of the Chief Rabbinate's religious monopoly.